A woman, exquisitely dressed, spins lightly on her feet, then stops, her back to a man directly behind her. The man pulls her tight and calmly drives a knife through her heart. And so dies Wen Jian, consort to an emperor and so-called most beautiful woman of the age. This scene is from Under Heaven published in 2010. 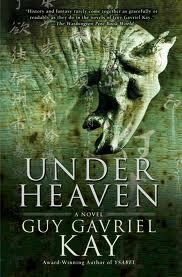 Written by Canadian Guy Gavriel Kay, it’s a historical fantasy modeled on the Chinese T’ang Dynasty. In his book Great Big Book of Horrible Things – The Definitive Chronicle of History’s 100 Worst Atrocities, Mathew White quotes a more “modest” figure of 13 million dead for the An Lushan rebellion, still ranking it number thirteen among his so called top one hundred disasters. White also calls it the Poets’ War because two of their [China’s] greatest poets lived and wrote during this time. He is referring to Li Po (701-763) – and Tu Fu (712- 770). Think of that: the Poets’ War. The poems written by these men are a fine reportage of the inner and outer reality of that devastating time. And so revealing that it can be named after their telling of those dark days. When critics say poetry shouldn’t be a documentary art I can point to these poets and say: really? Full moon is falling through the sky. Cranes fly through the clouds. to set this world to rights. I love the man who wrote that. I told you before, but there is so much burden in Chan Du (Tu Fu). Duty, assuming all tasks, can betray arrogance. The idea we can know what must be done, and do it properly. We cannot know the future my friend. It claims so much to imagine we can. And the world is not broken any more than it is always, always is. To try and understand the intricacies of translating Chinese poems into English is a hard task. I found a number of versions of Tu Fu’s poem in my library but the version in Under Heaven (not attributed to a translator) moves me the most with it’s last lines: ..I cannot find rest/ Because I am powerless/ To amend a broken world. He goes on to say: But maybe he was wrong. Maybe if a poem was true enough then sooner or later some of those who read it would live the image just as he was living it now. Or maybe some readers had the image before they even came to the poem and found it waiting for them there, an affirmation. The poet offering thoughts they’d held already. Under Heaven is full of astonishments like these and I don’t exaggerate when I say I have read it cover to cover at least ten times. It’s that rich and gorgeously crafted. Kay’s love for this period in Chinese history and particularly its poets is evident. And it is the poetry of this period that in a strange way becomes almost like another character in the novel. Kay stresses the political and social importance of poetry in his lightly disguised version of the T’ang. In a memorable scene in the Emperors palace two of Kay’s characters have a T’ang version of a slam poetry contest where the poems have to be made up and recited on the spot! The wonder of this book is how the poetry of the T’ang period is so seamlessly woven through the story. Early on in the book the central character Shen Tai has exiled himself to a remote part of China, burying the dead in an old battlefield days away from the nearest human habitation. He remembers his courtesan lover he has left behind in the capital city who warned him that if he left she could be purchased as a concubine for a wealthy man. He answers: You must do what seems best to you, for your life. I do not want you to be one of those women waiting at a window above jade stairs in the night. Let someone else live those poems. There is nothing casual about the reference to jade stairs. It refers to the poem by Li Po called Jade Stairs Lament made famous in the west through Ezra Pound’s translation published in 1915. Some say this poem, among others that Pound translated, had a transformative effect on modern poetry. Just through its images it conveys the story of a woman waiting late at night for a lover who never appears. J.P. Seaton in his 2012 book of selected poems by Li Po says: Ezra Pound’s ecstatic experience of this poem led directly to the beginning of “Imagism”, and thereby, for better or worse, to the creation of a new kind of poetry in America. In The Anchor Book of Chinese Poetry the editors add: Translations of Li Bai (Li Po) helped to establish a conversational, intimate tone in modern American poetry. Jade steps grow white dew. Night, late, has its way with her silken hose. So let the crystal curtain Fall…. Just a few last words on Li Po and then two more of his poems. There is something roguish and larger than life about this giant of a man (some say six and half feet hall) who fell in and out of favour with the Court and was subject to long periods of exile along the Yangtze. White characterizes him as an enthusiastic drinker, drifter, an alchemist and Taoist mystic! That comes through in Under Heaven! Battlefield: darkness: confusion, is it fog? blood drying purple on bramble. Crows argue the ends of man guts like reins. they can’t fly free of it. today: ghosts who cry beneath it. the blood of the pulsing of the drums. This entry was written by Richard Osler, posted on May 16, 2013 at 1:05 am, filed under Poetry and tagged David Hinton, David Young, Du Fu, Ezra Pound, Guy Gavriel Kay, J.P. Seaton, Li Bai, Li Bo, Li Po, River of Stars, T'ang Dynasty, Tu Fu, Under Heaven. Bookmark the permalink. Follow any comments here with the RSS feed for this post. choose to live in…” And thank goodness Richard that you choose always to come back and report to us from this wondrous place. Thanks, Richard, for bringing to our attention this intriguing sounding novel and for the lovely snippets of Chinese poetry. I plan to order two copies–one for myself and the other for my Sinophile son. My pleasure! Let me know how you enjoy the book!